Friends and Legacy puppy owners have asked us to provide something on the web page that would chronicle the environment and major activities at Legacy. I guess that gives us a good excuse to update the web site more often. Below is our home/business site on an acre which we completed building in April, 2004. The left end of the house contains Patty's grooming shop and indoor/outdoor kennel. 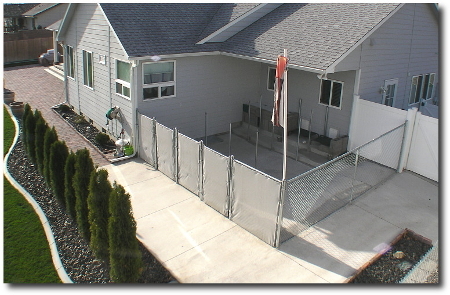 Two separate "potty" yards of pea gravel are adjacent to the shop, and the kennel runs are behind the shop. Patty runs a private grooming practice, but currently does not accept new customers. We always take in for grooming and boarding those Legacy pups placed in the local area. And yes, we were able to secure a kennel license, not an easy thing to do these days! The Legacy dogs love to run in that big back yard and we get a kick from watching them play. They often play what we call "Doggie Tag", in which one dog will take a toy in his mouth and lead the others all over the yard in a furious chase. We started training and showing dogs in the early 1980's, with Doberman Pinschers. Our involvement with dogs has always been a hobby for us, not a primary source of income. Mack had the highest scoring Champion Doberman Pinscher in obedience, CH Breakaway's Mastermind, in the US in 1986. 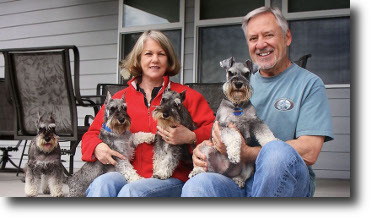 We later switched to Miniature Schnauzers and were able to get a good start with dogs from a long-time show breeder friend. Patty succeeded in having the number one ranked Miniature Schnauzer female, CH Legacy's Pied Piper, in conformation in the US, 1999. Then we had the number one top producing Miniature Schnauzer female in the US, 2005, CH Carmel Foxy Roxy At Legacy. In addition, we've had three other top-producing females, CH Sathgate Risque, CH Legacy's Pied Piper and CH Legacy's Ready-Aim-Fire. Above is the four-run kennel, which is indoor/outdoor. There are four "doggy doors" going into the house and inside the house is an area where each run can have a dog bed, one or more crates and food bowls. We did not fix chain link to the interior posts - that allows us to configure the kennel runs as needed with portable fence sections. For example, when no dogs are boarding, our own dogs can have the full run of the kennel area. The awning fabric on the gates, which face east, shades the dogs from the morning sun in the summer. 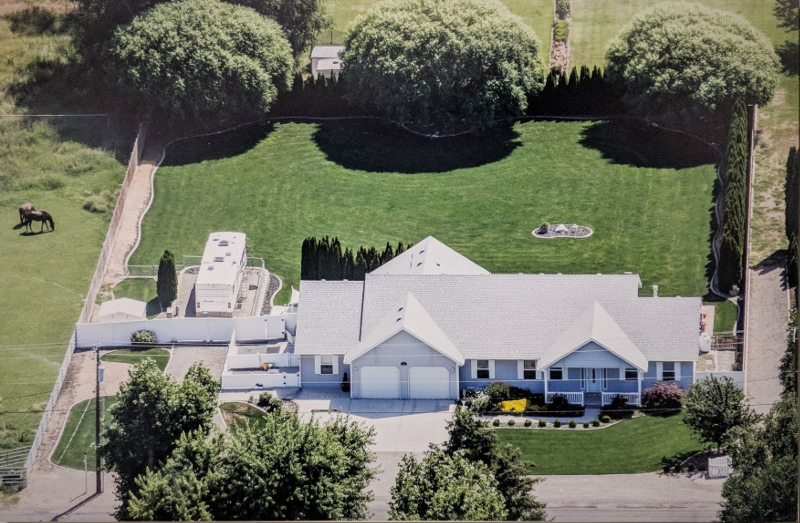 Below is a picture showing the grooming shop and the two "potty yards", which are filled with pea gravel. These are the main areas where we let the dogs out to potty. As you might suspect, that orange marker cone in the foreground is the most abused marker cone in the world. The male dogs head straight for it every time they go out. 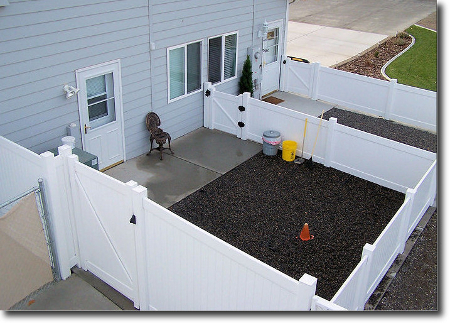 These yards and the outdoor kennel get sprayed down with a mild bleach solution on a regular schedule. The entrance to Patty's grooming shop is the door to the far right. The shop can handle four grooming stations operating simultaneously, with six 20-amp electrical circuits. But we limit our grooming clientele to what we can handle ourselves. 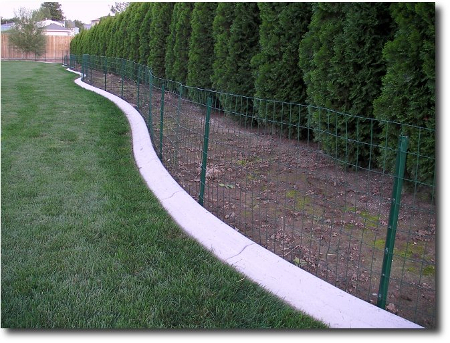 We use two- and three-foot green, vinyl-clad interior fence to protect the (unfinished) landscaping from the dogs and to keep them from doing any close fence fighting with neighborhood dogs. There are no leash laws here since we're not in the city limits. This kind of fencing practically disappears when seen from a distance. 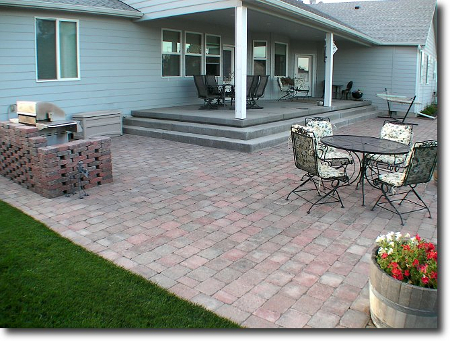 A point of pride: We laid this Roman cobblestone patio ourselves, after having the ground prepped with a bobcat. We figured we lifted 36,000 pounds of stone three times, several tons of sand and moved the stones and sand in by wheelbarrow - whew! We were asked if we'd like to do contract work; the answer was "No way!". For some reason, the dogs never use it as a potty area. We're grateful. More to come! We'll have more pictures and updates as time goes by. We also plan to include a page that will honor each Legacy Champion dog.